(Phys.org) -- A new study of termites has revealed that older workers are equipped with suicide packs of chemicals on their backs to fight off intruders. An international team of researchers, led by Robert Hanus and Jan obotník of the Academy of Sciences of the Czech Republic in Prague, looked at Neocapritermes taracua termites, native to French Guiana, and discovered that many of the workers had varying sizes of blue spots on their backs. The blue spots are external pouches containing copper-containing proteins secreted by specialized glands located on top of the salivary glands. When the researchers picked up the termites using forceps, they were surprised to find they burst, releasing a toxic sticky droplet along with fragments of intestines and internal organs. The team reported that the blue crystalline material is probably a hemocyanin protein (which has a similar function to hemoglobin in mammals, carrying oxygen around the bloodstream). The protein is rich in copper, which makes the crystal blue. Team member, PhD student Thomas Bourguignon of the Université Libre de Bruxelles in Belgium, said that the blue crystals mix with the products of the salivary gland and make them toxic. The researchers found that when a worker with blue spots was attacked by invading termites, it ruptured its body wall, releasing the contents of the blue pouches, which mixed with salivary fluid to form a drop of chemical so toxic that it paralyzed or killed most of the invading termites that touched it. 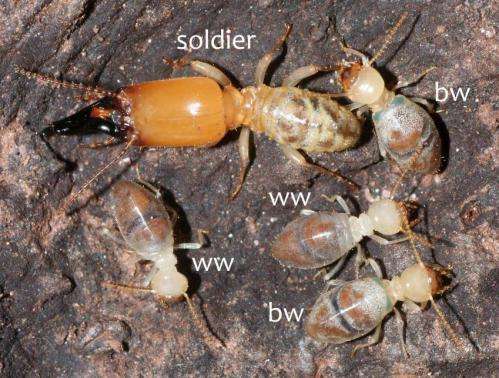 The blue-spotted worker termites died in the process. Workers with no spots also burst when threatened, but less readily and less effectively since the toxins released were much less potent than that from the blue spots. The team tested the effectiveness of the toxins by dabbing a drop of fluid on the bodies of enemy termite species. They compared the blue liquid of the older workers (containing the crystals and products of the salivary gland), the liquid with the blue crystals removed, salivary fluid from younger workers, and the same fluid with blue crystals added. They found the most toxic was the blue liquid from the older workers, and next in line was young workers salivary fluid mixed with blue crystals. The study also demonstrated that the number and size of the blue pouches increased with the workers age. The workers capacity to do other work such as gathering food diminishes with age, and as they become less useful to the colony in other ways, and less able to defend the colony using their jaws, their capacity to act as suicidal defenders of the colony increases along with their willingness to sacrifice themselves. 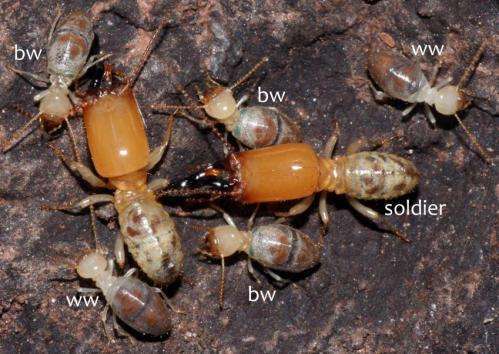 Suicidal explosive behavior has been seen before in termites, but the contents of the intestine are usually expelled rather than toxins as found in the N. taracua termites, and the enemy termites are usually inconvenienced and slowed down rather than killed. By nature, defensive behavior is risky. 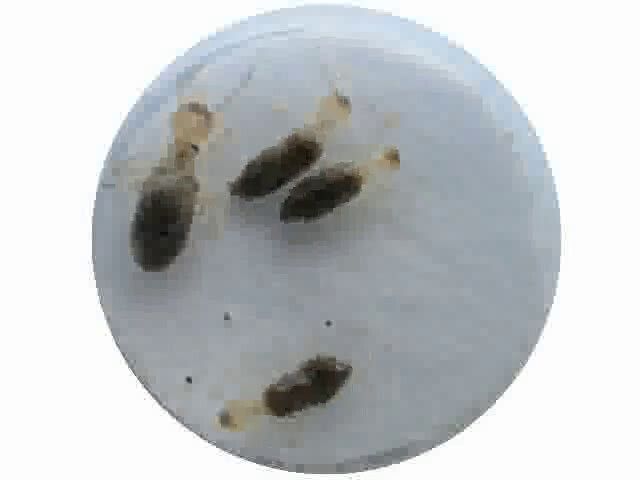 In social insects, such behavior is more likely to occur in individuals whose potential for other tasks is diminished. We show that workers of the termite Neocapritermes taracua develop an exceptional two-component suicidal apparatus consisting of copper-containing protein crystals, stored in external pouches, and internal salivary glands. During aggressive encounters, their bodies rupture, and the crystals react with the salivary gland secretion to produce a toxic droplet. Both the amount of defensive substances and the readiness to explode increase with workers age, as their food-collecting ability declines. This outdates human suicide bombers by millenia--insect suicide bombers--wait til some sicko isolates that gene & implants it in our soldiers/or someone else's soldiers--you know they will!!! Case of religious fanatics copying termites or super-intelligent altruistic termites watching TV over our shoulders and reporting back to their tribe or the simpler possibility that its a built in pattern of vengeance some species use to disrupt others ? "One can have the most enlightened creed or means of governance but, the Sheep must beware of the Wolves as it is the nature of Wolves to devour Sheep"
Education, so we dont allow any Wolves to enshrine their intrinsic predatory patterns in laws and regulations to the disadvantage of the weaker, feeble and uneducated members of society and especially so in a democracy which is often on the razor's edge of stability. "The only form of government where the majority get what they deserve"
The "explosion" in the video is slightly anticlimactic. I was rather hoping for termite vaporization. Just when you think you know a thing or two about nature a freaking exploding chemical weapon terimte comes along and makes you feel like you know nothing again. No exploding penguins? I forgot. They are all just resting.